That was my question, too, when I and some select members of the press met with Jude Turcuato, FOX Networks Group Philippines’ senior vice president and general manager, during a roundtable interview the network hosted at its headquarters in BGC a few weeks ago. Jude, obviously a film buff, said that they spent at least two years on studying nearly 100 scripts and pitches before going for Maledicto. They started filming the original production in March 2018. And if the film does well at the tills, it already has a ready sequel. So, it’s safe to say that we’re talking about a “very good” material here. A scene from the highly anticipated summer horror thriller which unspools in cinemas nationwide on Labor Day. “I felt like that it would entertain people differently as a genre. It’s a horror-thriller. I think most of the Philippine horror, is just horror. There’s no thriller aspect to it. That combination, for this one, was the one we felt would give us a really good shot,” the executive shared. Maledicto tells the story of Fr. Xavi (played by Tom Rodriguez), a former psychologist who becomes an exorcist after the tragic and mysterious death of his sister, Mara (Inah de Belen). He meets Sister Barbie (played by Jasmine Curtis-Smith), a young nun who has the special gift of charism. Together, they deal with the case of Agnes (Miles Ocampo), a seemingly perfect teenager who starts manifesting demonic behavior that will rock the foundations of the church and put one’s faith to test. But what does Maledicto specifically mean? The foreign world doesn’t ring a bell. The network executive divulged that plenty of bad words are spoken in the film especially during the scene where one of the characters is possessed by a demon. Hence, the title of the film. Maledicto is the first-ever Filipino film Fox Philippines is producing and it’s financed by its mother company, 20th Century Fox studios, in Hollywood. “We didn’t need to do this because our parent company is already very successful in Hollywood doing it. But we wanted to be able to kind of take that learning and bring it here, and maybe to a certain extent, improve and upgrade the quality of Philippine cinema as well, if we do it,” Jude said. Meanwhile, during the press conference for the film, the lead cast talk about what people can expect from the film, and shared some behind the scenes stories. “My character here is not the typical priest that you’d normally encounter. Fr. Xavi used to be a psychiatrist. He’s a skeptic, he doesn’t believe in demon possessions or anything supernatural. Even if there’s an evidence he would still dismiss the idea,” the Kapuso actor said. “He became an exorcist because he wanted to immerse himself in a world that he doesn’t understand. In the film, he encounters a situation that he can’t explain,” Tom added. For Miles, who portrayed the possessed student in the film, admitted that she had second thoughts when the role was offered to her. “At first, natakot ako. I wasn’t comfortable but when I started reading the script I realized that it’s a great story and it’s a collaboration between Cignal and Fox so I believe I was in good hands,” Miles shared. For Jasmine, she portrays an unconventional role in Maledicto. It’s her first time to play the role of a nun, in a horror-thriller at that. The 24-year-old actress added that she felt secure throughout the shoot as they always prayed before taping their scenes. 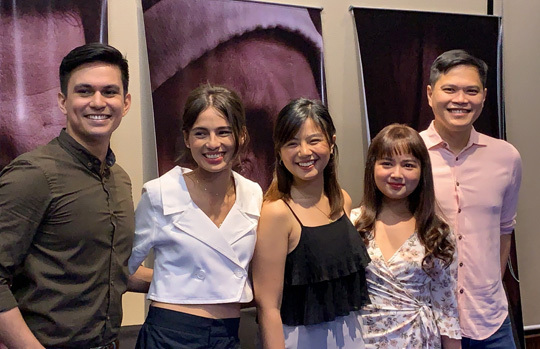 Fox Philippines' Jude Turcuato with 'Maledicto' lead stars Tom Rodriguez, Jasmine Curtis-Smith, Miles Ocampo, and Inah de Belen. Directed by Mark Meily, Maledicto is co-produced by Cignal Entertainment and Unitel. The other cast members are Eric Quizon, Martin Escudero, Franco Laurel, Nonie Buencamino, Liza Lorena, and Menggie Cobarrubias. The movie unspools in cinemas nationwide on May 1.